As an integral part of our awareness raising efforts this month, we closed out our year-long series of patient-centered programs entitled Messages of Hope with a conversation with MLB legend, Ken Griffey, Sr. 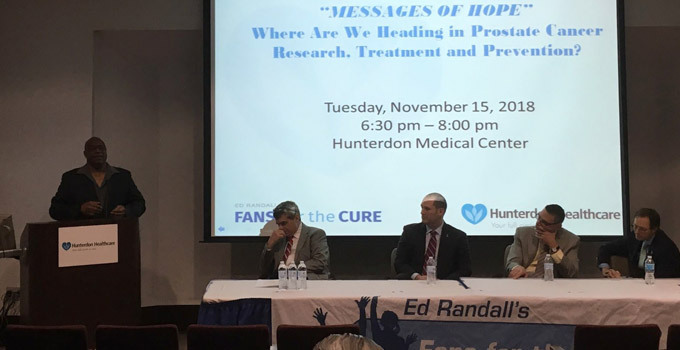 Together with our partner, Hunterdon Healthcare, we hosted a conversation about the current state of prostate cancer research, treatment and prevention. This prostate cancer awareness and education event featured a keynote address by Ken Griffey, Sr., who is a prostate cancer survivor. Mr. Griffey spoke of his ten-year journey with prostate cancer (first diagnosed in 2006) and his family’s history with the disease. Mixing a conversation about baseball with valuable information about the state of prostate cancer testing and treatment, Hunterdon Health’s medical professionals briefed the men and women in the audience about trends in treatments and care, the program featured three physicians. We are grateful to Dr. Brian Sperling, Dr. Andrew Greenberg and Dr. Myron Bednar for the generous contributions of their time, knowledge and experience. The Hunterdon Health doctors collectively addressed issues such as more men coming to doctor visits and receiving diagnosis of advance prostate cancer because of fewer men being screened, treatment options and the need to advance clinical trials for new prostate cancer medicines, among many other issues. At Fans for the Cure, we were especially grateful for the wonderful support from our partner, Bayer Oncology. Bayer Oncology’s grant enabled us to begin the Messages of Hope tour in Nashville, TN, in December 2015. We then took our messages about prostate cancer, testing, and treatment to Cleveland, Los Angeles, and New York City.